1983, age 15, with my first coach and wonderful mentor, Tony Nicholls. How long have you been orienteering for? 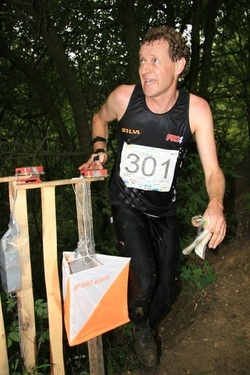 I started orienteering in 1981 and have been orienteering more or less ever since. How did you get introduced to the sport? I started orienteering at intermediate school in Auckland as part of PE and accepted an invitation from my teacher Vicki Lowrie to try a club event in the forest. I was completely hooked from my very first 2.0 km white/wayfarer course. I was fortunate to be coached by Tony Nicholls right from the beginning, and the support from my family, Auckland Orienteering Club and long-time coach and mentor Dave Melrose, were major factors in me continuing in the sport. What overseas orienteering experience have you had? Have you ever been to Bulgaria? My first overseas orienteering trip was in 1985 to WOC in Australia as part of the Aust/NZ Challenge team. After seeing the best in the world, I knew what I wanted to do. Subsequently I’ve been lucky enough to participate in 10 WOCs, numerous World Cups, the Park World Tour, the O-Ringen Training Clinic, several WMOCs and many other international races. I’ve orienteered or navigated, as part of adventure racing teams, in approximately 30 different countries although Bulgaria will be a new country to add to the list. What is your best international result? My best WOC result is 28th in what was the short distance in 1993 in the USA. My best World Cup placing was 16th in NZ in 1994. My best World Ranking was 35th in 1994. I’ve qualified for long, middle and sprint WOC finals, the last by 0.7 seconds in the sprint in Sweden in 2004. I have raced many relays on first, second or third legs including a 5th on a second leg in a World Cup race in the Czech Republic, and with a team best of 11th in the Czech Republic in 1991. Sadly JWOC began the year I turned 22. I’ve won the Sorlandsgaloppen 6–Day in Norway in H21K, an open sprint race in Tasch in Switzerland, and have placed in M/H21 in the Czech Republic 5-Day, the USA Champs, Asia Pacific Champs and Australian Champs. I still race hard and like to be at the sharp end of the H45 age class and have a WMOC best of 4th in the sprint. I love coaching at any level and really enjoy watching orienteers develop their skills. I was part of the junior coaching scene in NZ through the 90s with Rob Garden and Michael Wood. In addition to these and other NZ peers (e.g. Ralph King, Dave Melrose), I learnt a huge amount about coaching from Lars Sjokvist, the Swedish NZ WOC team coach for many years. 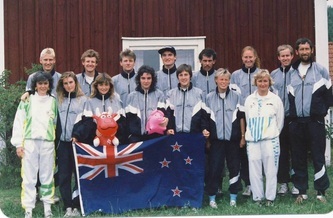 I was the coach/manager of the NZ JWOC team to Romania in 1996. In addition I’ve helped coach the ACT Junior Squad, the South African JWOC team and many other groups and individuals at all levels of ability from ages 5 to over 70. What is your most memorable overseas experience? That’s hard to say. My first time to Australia as a junior representing NZ and seeing the world’s best was very special and motivating. My first WOC in Sweden was an amazing experience even though my performances were poor. 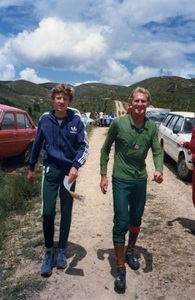 Coaching the NZ juniors in Romania was great, remembering watching terrific performances from my fellow Australasian orienteers including Katie Fettes, Tania Robinson, Marquita Gelderman, Rachel Smith, Alistair Landels, Chris Forne, Hanny Alston, Lizzie Ingham and Richard Bolt gives me goose bumps just thinking about them, racing at WOC in Finland with my great friend Mark Lawson was fantastic, and for sheer enjoyment, the Swiss 6-day in the mountains around Zermatt was simply unbelievable. Really there are too many other memories to list but they usually involve sharing some superb maps, exciting races and fantastic adventures with some great people. Do you have any tips for the JWOCers who are on their first European trip? Without hesitation I would say “Enjoy the moment and learn from the experience.” Try to enjoy the orienteering regardless of performance, the atmosphere, the excitement, the team camaraderie, the places and the adventures. Learn from your experiences, from your peers, from the coaches, from what you see, from the good orienteering you do and from your mistakes; ask questions, try things and make the most of all the training. If you do this and try to maintain a positive attitude you WILL be better next time. You have a trip to Greenland planned before meeting the team in Bulgaria …. What are you doing there? Ilulissat is a small coastal village on the west coast of Greenland. In the middle of every year the Ilulissat Orienteering Club holds the Arctic Midnight Orienteering competition comprising 3 events, a sprint, a middle and a long (20 km). Each event takes place at night but with 24 hour sunlight it’s just like day. I’m heading up to this competition for my pre-Bulgaria warm-up (or cool down depending on whether it’s snowy or not).